Just dial the Tourism Hotline 28 333 000 for immediate assistance via operator or recorded round-the-clock message. 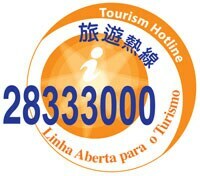 Macao Government Tourism Office (MGTO) offers a dedicated Tourism Hotline 28 333 000, with a wide range of tourism related information available including dining, hotels, sightseeing, museums, entertainment, shopping and transportation. The 24-hour service provides an operator or recorded message to provide assistance, handle enquiries and receive suggestions or complaints from visitors and local residents. The service is in Cantonese, Mandarin, English, Portuguese and Japanese. * If calling from overseas, please dial +853 28 333 000.